We speak to Alex from The Marylebone Trio about performing a variety of music at a whole range of events. 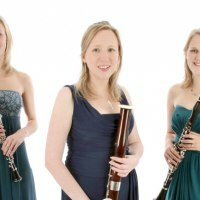 The Marylebone Trio are a classic woodwind trio from London formed by three friends from the Royal Academy of Music. Since joining Add to Event they’ve been able to provide quotes for a variety of events across the UK to clients looking for a unique music choice for their event. Please tell us a little bit about the trio's background and how long you’ve been playing at events for. The trio was formed at the Royal Academy of Music in 2003, and has been playing at all sorts of events ever since then. It’s a woodwind trio, formed of oboe, clarinet and bassoon. When we first got together I don’t think we had any idea it would turn into such a success! We’ve done concerts all over the UK, travelled the world on cruise ships, and been involved in education projects for hundreds of school children. Over the past 12 years we’ve played at weddings, celebrations and corporate events in a real variety of places, including Kew Gardens, Lincoln’s Inn and the National Portrait Gallery in London, and a long list of venues around the south and Midlands. What do you like most about performing at events? The variety is one of the best things – one day you’re in a posh hotel, the next at a country barn. We love to work with our clients to give them exactly the personal experience they’ve imagined, and we aim to be able to arrange any piece of music they want – not just standard classical music. That’s led to some really individual events! Over the years we’ve been asked to arrange everything from Mozart to Massive Attack, via the Frog Chorus. Playing someone’s favourite piece of music as they walk down the aisle is a really special thing – you get a real buzz from being an important part of that person’s lifelong memories. What's the most interesting event you've performed at? Do you have any interesting stories or things that have happened whilst playing gigs? We could probably fill a book with the funny stories that have happened and interesting people we’ve met over the years! One of our favourites was the wedding that nearly ended in disaster, when the groom’s hands were shaking so much that he dropped the ring. We were in a very old venue with a floor that sloped and had gaps between the floorboards, and the ring started to roll towards a big gap. Luckily our oboist was nearby and managed to stop it with one quick, elegant stretch of the leg, and quickly the gasps of horror changed to a round of applause. I like to think we saved the day on that occasion! What are the aspirations for the Trio over the next few years? Playing for a wedding in the Maldives? (Anyone? We’re open to offers!) We also want to expand our collection of music from all genres, and prove to people that classical music isn’t stuffy and boring! How have you found using Add to Event? What do you like most about it? It’s a really great way for clients to collect ideas that they might not have thought of, or focus in on what they want to have for their event. In our case, I think some people have come on the site thinking about maybe a string quartet, but then have had a quote from us, heard our music, and got something a bit different. That’s important for us because a wind trio isn’t the most obvious choice for a lot of people. It’s also a good way for clients to get several quotes and build up a conversation with suppliers so they get something they really like. Please tell us about a booking you've had through Add to Event, how did it go? Would you recommend to others? We provided music for a 90th birthday celebration in a hotel for 60 guests a couple of weeks ago. The client said that it was really easy to book and communicate using the site, and we found it very straightforward as well. It was good for them to be able to provide plenty of information about what they wanted, and it helped us too as it meant we could tailor our offer to their specific requirements for music and dressing to match the colour scheme. It was a very enjoyable afternoon all round and the family made us feel appreciated. We’d recommend the site to both clients and suppliers. As a woodwind group, The Marylebone Trio may not be the obvious choice but they are a great example of how Add to Event can offer event planners new or unusual options they may not have otherwise thought of. If you perform at events and are not yet a member of Add to Event please join today and let us help you to get some great new gigs like we have for The Marylebone Trio.